Those of you who read this blog regularly know some of the common tactics that anti-vaccine activists use. They're fond of the Pharma Shill Gambit, in which they accuse those with whom they disagree as being paid by pharmaceutical companies. This allows them to blissfully dismiss anything their detractors have to say. If you're paid by pharma, after all, you're hopelessly biased and nothing you say can be taken as true or honest. Of course, it doesn't matter whether you actually get paid by pharma or not. Facts don't tend to matter much to those using the pharma shill gambit. That brings us to another tactic: dishonest or misleading rhetoric. The less, shall we say, sophisticated anti-vaccine activists aren't all that subtle about it. They will brazenly state as truth claims that are easily shown to be wrong (e.g., the false claim that MMR has the preservative thimerosal in it, or that vaccines contain antifreeze; they don't). The more skilled among the anti-vaccine movement, however, use insinuation. They imply certain claims using language that, on the surface, is technically true or could be classified as opinion, but the unstated claim is at best misleading and at worst dangerously wrong. Did you get a flu shot last year and then get sick? [Yes, the ad has that last bit in a larger font.] Know the risks. Know the failures. Know your options. The implication is pretty clear: the flu vaccine makes you sick. Others have already called out the NVIC for this misleading ad. Moms Who Vax notes that the vaccine cannot make you sick, and castigates the newspaper (the Concord Monitor-News for accepting the ad). My friend René also expresses his displeasure with the paper, focusing on the disservice and risk behind running the ad. Is the ad incorrect? Well, it doesn't make any actual claims of fact, so that question is the wrong one to ask. Is the ad misleading? Yes. Resounding from mountain top to mountain top, yes. Here's why. 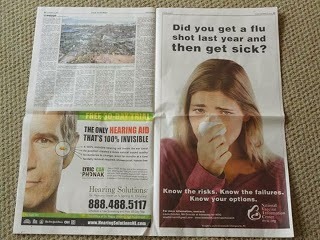 The central myth behind the ad, and which the ad implicitly states, is that the flu vaccine gives you the flu. Many of those opposed to the vaccine repeat the same or similar stories: "I got the vaccine, and then I got sick." In their minds, the former caused the latter. The problem is that it isn't true. At least the causal bit of the argument, considering that, with the exception of the live virus vaccine, it is physically impossible for the flu vaccine to cause an influenza infection. Fall and winter are basically the happy hunting grounds for a variety of airborne viruses. People tend to spend more time in enclosed spaces with lots of other people. There are, quite literally, hundreds of different viruses that cause similar symptoms: runny nose, fever, aches, sore throat, etc. (Here's a list of some diseases that have flu-like symptoms.) So the first question is: how do you know that what you have is actually the flu? The only way to determine for sure is to get some lab tests done to confirm the presence of the influenza virus. That's a step that people tend to skip. They just feel like crap during the time that's considered peak for the flu and they assume that they have the flu. But suppose they actually do have the flu. The influenza virus has made its way into their respiratory system and is busy invading cells, replicating and causing all sorts of mayhem in their body. They might assume that since they began showing symptoms of the flu after they got the vaccine that the vaccine caused it. Not so fast, there, bub. The virus takes anywhere from 1-4 days to incubate before any symptoms begin to appear. That means you could be exposed to the virus, get the shot, then get symptoms caused by the virus having replicated enough to start causing issues. Then there's the fact that it takes about two weeks for your body to develop immunity after receiving the vaccine. So even after getting the vaccine, there's a decent sized window where you can still get infected. If that happens, again, the viral infection is what's causing the symptoms, not the vaccine. Putting those two together, then, if you start showing symptoms anytime between the same day you got the vaccine up to around two weeks later, the most likely explanation is that you were infected by some other virus or that you were infected by influenza before your body had a chance to develop vaccine-induced immunity. Plenty of opportunity, in other words, to mistakenly attribute the cause of your woes to the vaccine. But that's not the only myth hiding behind the NVIC ad. They also talk about failures. This bit of misdirection promotes the myth that the vaccine doesn't work. Suppose you get the vaccine, more than two weeks pass by uneventfully, and then you start to get flu-like symptoms. Again, without lab confirmation, you can't be certain it's even influenza causing your illness. It's also possible that it is influenza, but a different strain than what was included in the vaccine. The vaccine usually includes only 3 strains, which are determined to be the most likely dominant strains for the season, based on worldwide flu surveillance. Some years, it's a very good match, and most cases of influenza are prevented. Other years, the match is not as good, and there will be more cases of influenza. But even when it's not a perfect match, the course of illness still tends to be milder. In general, the vaccine ranges from moderately effective to very effective at preventing infection, depending on how well it matches the dominant strains and how many people actually get immunized. It is better than not immunizing, and better than wearing a mask. Finally, there's the bit about "knowing the risks". The implication, again, is pretty obvious, though they don't state anything outright in the ad itself: the vaccine is dangerous. Of course there are risks with the vaccine, just as there are with everything in life. As with anything that has a biological effect, the vaccine can produce side effects. Most common are local reactions at the site of the injection, such as a sore arm. Less common than that are mild flu-like symptoms that last only 1-2 days, rather than the full-blown symptoms lasting on average 2-3 (but sometimes as long as 5) days. Very rarely do people have more serious effects from the vaccine, like an allergic reaction. The live, attenuated virus vaccine is more likely to cause mild flu-like symptoms than the injected version, but they are still milder and of shorter duration than the disease itself. There have been scare stories of serious adverse events, like Guillain-Barré Syndrome, following vaccination, but research indicates that this risk is comparable to the regular background rate of GBS (about 1 in 1 million), and there is doubt whether or not the vaccine actually does cause GBS. The vaccine does not carry those risks, but the NVIC doesn't want to advertise the fact that the vaccine might actually be, y'know, beneficial. In fact, a recent meta-analysis found that the influenza vaccine can reduce the risk of cardiovascular events, such as heart attack and stroke, especially among those with higher risk coronary disease. You can, hopefully, see how the NVIC ad paints a negative and very misleading picture of the flu vaccine. The suggest that it makes you sick, that it's dangerous and that it doesn't work. Although they are not explicitly lying, they are being dishonest. It's something they've done before, and they'll probably do it again. For an organization that purports to be all about informed choice, they sure go out of their way to ensure people are misinformed.